Breakfast is possibly the best meal of the day. I mean, who can say no to bacon. However, I must admit, as much as I love a good savory bacon filled meal, a good sweet breakfast often hits the spot. These are five of my favorites that have graced my table. No, I am not referring to eating sweet small Dutch children. Dutch Babies are a large fluffy pancake, not unlike a German Pancake. Once cooked they form a small fluffy pancake stadium that you can fill with fresh fruit and whipped cream! To make, place butter in a pan and set in a 425⁰ oven. While the butter melts, mix batter quickly. Put eggs in a blender or food processor and whirl at high speed for one minute. With motor running, gradually pour in milk, then slowly add flour; continue whirling for 30 seconds. 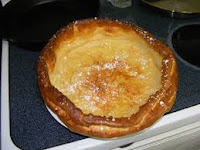 Fill Dutch Baby with fresh fruit and homemade whipped cream or squeeze lemon and sprinkle with powdered sugar. Best served fresh out of the oven. This is my favorite pancake recipe on the planet. 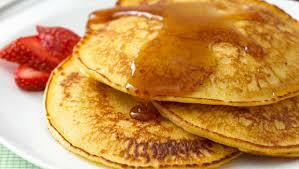 These pancakes are light, creamy, protein packed wonders! They also happen to be super easy to make. Savory crepes seem to be all the rage these days and seem to overlook the joy of a sweet crepe. 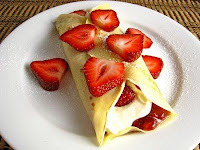 This crepe recipe is on the sweeter side and is fantastic filled with fresh fruit like strawberries, raspberries, or peaches with a dollop of homemade whipped cream. In blender, whirl milk, eggs, and flour until smooth. Use a 6-8” frying pan, spray the pan with cooking spray or melt butter into the bottom of pan. While on medium heat, pour about 2 tablespoons batter in the pan. While pouring the batter or quickly after pouring, tilt pan so that batter covers the entire flat surface of the pan. Cook until the surface is dry and edge is lightly brown, then flip and lightly brown the other side. Serve warm out of the pan or cooled. Lay crepe on a plate and scoop fresh berries or peaches inside with a dollop of homemade whipped cream. Wrap like a burrito and let your taste buds be dazzled! Waffles are always a must on a sweet breakfast list. They are a tried and true favorite. I will not claim to have found the best recipe under the sun for waffles, however I will say that it is quick, easy and delicious. In a medium sized bowl, combine flour, baking powder, salt, and sugar; set aside. In a medium size bowl (I prefer a kitchen aid if you have one), beat egg whites until stiff moist peaks form. Add the egg yolks, milk, and salad oil to the dry ingredients and stir until smooth. Then fold in the egg whites. 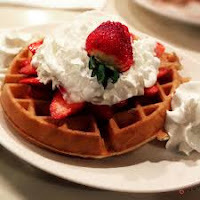 Cook on waffle iron until desired browning occurs. Top with fresh fruit and whipped cream (can you see a theme here), or my wife’s favorite, peanut butter and maple syrup. muffin tin but can be made in a normal sized muffin tin as well. Beat together butter and ½ cup sugar until well blended, then beat in egg. Mix together the dry ingredients and alternate pouring with milk, into the butter-sugar mixture. Mix thoroughly. Spoon about 1 rounded teaspoon into each greased 1 ½ inch mini muffin tin (if using regular muffin tin fill each cup half full with batter). Bake in a 375⁰ oven for 20 minutes or until golden brown. Remove from pans. 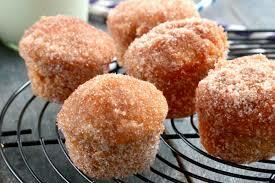 While still hot, dip each muffin entirely into melted butter, coating evenly, then roll in cinnamon-sugar mixture. Can be served warm or cold, but are best warm right out of the oven. Disclaimer: If you aren’t drooling by the time you have reached the end of this post, then these recipes aren’t for you. These are definitely not for you if you support a vegan diet, eat kale, use butter or sugar substitutes, are gluten-free, or think you can substitute whole wheat flour for regular flour. Disclaimer Two: Consuming the above recipes has been known to cause tears of joy, happiness, families to come back together, and just general elation with life.